Cavitation is a process consisting of the repeated nucleation, growth, and violent collapse of bubbles in a liquid. When a pressure change occurs in a liquid, cavities will form and grow under tensile stresses, and collapse under compressive stresses. Cavitation can occur in any liquid in which the pressure fluctuates either because of flow patterns or vibrations in the system. The characteristics of cavitation impact are localized, dynamic, and at least initially, compressive in nature. Because the material is not deformed as a whole, the deformation of one grain or one phase within a grain is not influenced by the behavior of the surrounding grains or phases, as it would be under bulk deformation conditions. Thus, the theoretical and empirical “rules” that have been developed, to describe and explain the various strengthening mechanisms in different materials do not always apply to the resistance of the material to cavitation erosion. For example, second phase strengthening almost does not contribute to the erosion resistance. Added to this localized loading factor is the dynamic, shock-like nature of the loading. The properties of the material are different from static mechanical properties. Some experiments show that mechanical resistance under impact load is some times larger than that obtained under static load, and the plastic energy needed to form an indent dynamically for some materials can be about 10 times larger than for static conditions. No universal correlation with quasistatic mechanical properties has been observed. IV. A steady-state region where the erosion rate is substantially constant. Each material will have a characteristic erosion curve. The extent of each stage is also a feature of each material. As illustration, in the paper of Chauhan K.A, cavitation erosion tests were conducted on as cast 13/4 and 21-4-N steels and hot rolled 21-4-N steel. The samples for cavitation erosion tests were cut by a diamond cutter of 10 × 10 × 4 mm dimensions, ground and polished in order to obtain a surface free from scratches. Cavitation erosion resistance was measured by means of an ultrasonic vibratory test. The ultrasonic vibratory test comprises of an electronic generator that generates 250 watts of average electrical energy. The transformer or velocity horn amplifies the small vibrations. It is attached to a pair of lead zirconate titanate transducer elements. This system uses a device to vibrate the probe immersed in distilled water. During half of each vibration cycle, a low pressure is created at the test specimen surface, producing cavitation bubbles. During the other half of the cycle, bubbles collapse at the specimen surface producing damage and erosion of the specimen. Although the mechanism for generating fluid cavitation in this method differs from that occurring in flowing systems and hydraulic machines, the nature of the material damage mechanism is believed to be basically similar. The method therefore offers a small scale, relatively simple and controllable test that can be used to compare the cavitation erosion resistance of different materials and to study the nature and progress of damage in a given material in detail. This standard test procedure for ultrasonic cavitation testing has been approved by the American Society for Testing and Materials (ASTM) as ASTM G32-06 (2007). The test specimen was placed at a small distance of 1 mm below the tip of the ultrasonic probe. The cavitation erosion was conducted for a total duration of 32 h each and weight loss was measured at every successive stage of 4 h. The samples were cleaned in acetone, dried, weighed to an accuracy of 1 × 10−4 g using an electronic balance, eroded in the ultrasonic vibratory processor for 4 h and then weighed again to determine weight loss. The eroded surfaces were studied on optical microscope and SEM to identify the mechanism of cavitation erosion. SEM study of eroded surfaces was conducted using FEI Quanta 2000 field emission scanning electron microscope (FESEM) at an accelerating voltage of 20 kV. 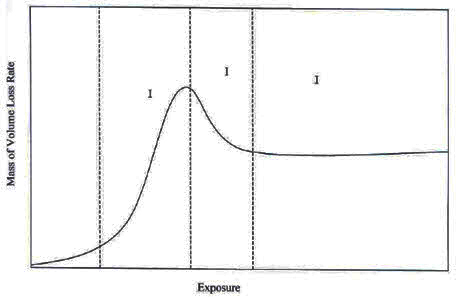 The cumulative weight loss due to cavitation erosion for the samples in this investigation is plotted as function of time of cavitation erosion in Figure 2, while Figure 3 presents mean depth of erosion (MDE) versus time of erosion curve. MDE is calculated using equation (1). From Figures 2 and 3 it is noticed that cumulative weight loss versus time of erosion curve and MDE as function of time of erosion curve are almost identical, because of the marginal difference in the densities of 13/4 steel (7.795 gcm−3) and 21-4-N steel (8.137 gcm−3), which is the only variable in the determination of MDE in this investigation. 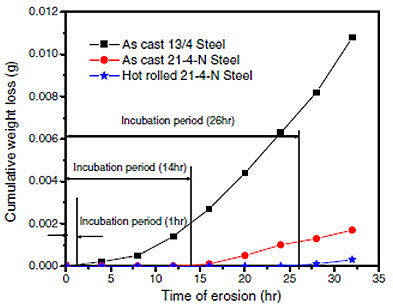 The erosion rate in as cast 13/4 steel is more than that in 21-4-N steel in both as cast and hot rolled conditions similar to solid particle erosion rate as described in our earlier paper. 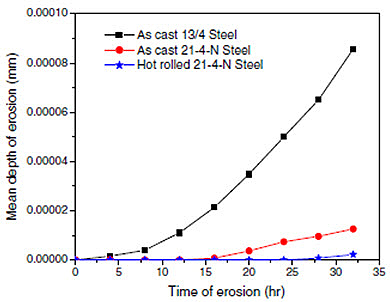 However, the erosion resistance of 21-4-N steel in both cast and hot rolled conditions in cavitation erosion is far better than that in solid particle erosion. The results show that hot rolled 21-4-N steel is more cavitation erosion resistant than the 13/4 and 21-4-N steels in as cast condition.